Here is the First Responders Guide. This guide is a summary of the protocols used by the First Responders. 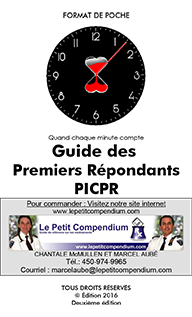 The First Responders Guide, 2nd edition, is builted on a pocket size. Your will find protocols like ACP, RÉA, SIN, IND., ENV., MED., OBS., PED., MED-LEG , TRAUMA and TECHNIQUES. Dimension : Pocket book size 7.5 cm X 12.5 cm (3’’ X 5’’). Binding : Spirale partie supérieur. Impression : Black and white on both sides of the page. No. of page : 86 Laminated pages. Content : Protocoles PR, modules 1 to 10 summary. Reference : Heart and stroke foundation of Quebec, PICPR, Anatomie le Totora. Price : $26.95 unit (taxs and shipping not included). The price may vary without notice. Have the good answer for the good move!